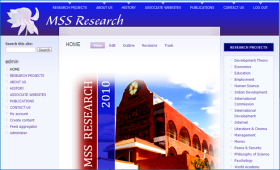 MSS Research is the social science research division of The Mother's Service Society, a non-profit organization established in Pondicherry, India in 1970. The activities of the Society are inspired by the integral philosophy of Sri Aurobindo and The Mother and organized to extend and apply their vision in different fields of life. The Society's objectives include a wide range of educational and research activities with particular emphasis on social science research in the field of socio-economic development. 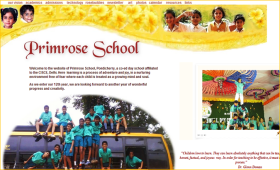 Primrose School was established by The Mother's Service Society in June 1999 in the former French colony of Pondicherry as a pioneering model for early childhood education applying methods developed by American educator Dr. Glenn Doman in a computerized self-learning environment. Primrose has been widely recognized as the most advanced institution for early childhood education in Pondicherry. Primrose is affiliated to CISCE (Council for the Indian School Certificate Examinations), New Delhi. In 2010, the educational programme at Primrose School is being extended to include thirteen levels from pre-kindergarten up to the tenth grade. 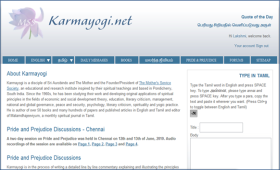 Karmayogi.net contains a very large volume of original writings in English and Tamil by the Society’s Founder-President Karmayogi. Since the 1960s, he has been studying their work and developing original applications of spiritual principles in the fields of economic and social development theory, education, literary criticism, management, national and global governance, peace and security, psychology, literary criticism, spirituality and yogic practice. He is author of over 50 books and many hundreds of papers and published articles in English and Tamil and editor of Malarndhajeeviyum, a monthly spiritual journal in Tamil. 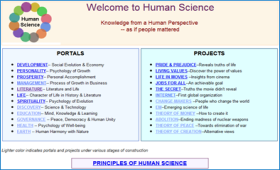 The Human Science Project was established by MSS Research in 2007 as an effort to develop a unifying theoretical basis for all the fields of social science and humanities. The objective of Human Science is to gain insight into the universal principles and processes underlying all fields of human activity and accomplishment -- inidual and collective -- political, economic, social, psychological and artistic. The site, which is still under construction, presently consists of twelve portals covering fields ranging from peace, governance, environment and social development to personal accomplishment, psychology, and the philosophy of science. 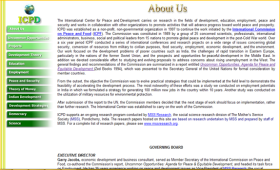 The International Center for Peace and Development was established in 1997 by MSS Research as a non-profit, non-governmental organization based in Napa, California, to continue the work initiated by the International Commission on Peace and Food (ICPF). ICPF was constituted in 1989 by a group of 25 concerned scientists, professionals, international administrators, business, social and political leaders from 15 nations. ICPD promotes research and implementation of programs relating to peace and conflict resolution, democratization, development strategies, employment, food security, and transition economic strategy. 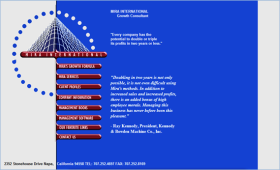 Mira International is a management consulting firm established in Napa, California in 1987 by Garry Jacobs and Robert Macfarlane. Mira works with companies and business associations in a wide range of industries, both national and international profitability. Mira services include designing, organizing and conducting major conferences for business associations in a wide range of manufacturing, service and retail industries. It also conducts in-depth strategic growth assessments and planning processes for companies around the globe. It provides training for executives and senior management to energize their businesses for rapid growth, coping with challenges of rapid growth, and other topics. 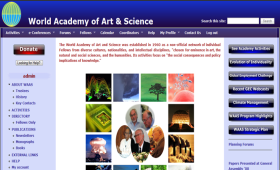 The World Academy serves as a forum for reflective scientists, artists, and scholars to discuss the vital problems of humankind independent of political boundaries or limits, whether spiritual or physical -- a forum where these problems can be discussed objectively, scientifically, globally, and free from vested interests or regional attachments. Since 1992, MSS Research has been collaborating with WAAS on research projects relating to the abolition of nuclear weapons, theory of development, the future of science and money. There is an urgent need today to understand why the old theories were created, where and why they fail now and then propose a feasible, more efficient alternative. 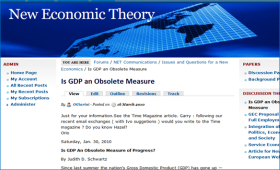 This is the rationale and justification for a re-evaluation of the fundamental concepts and premises of modern economic theory with the goal of evolving a truly human-centered economic theory and practice. Romance Eternal is based on extensive research carried out by MSS on love, marriage and romantic relationships, the graded levels of harmony and love, the most common problems affecting partnerships, and effective strategies for increasing marital harmony and romantic fulfillment based on universal, principles of life and human relationship known to many cultural traditions in the past and successfully applied in the lives of countless iniduals. The site includes articles on many subjects and an expert advice system for the public. 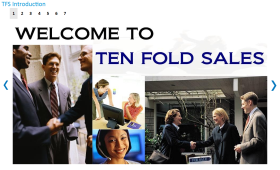 Tenfold sales is a project undertaken by MSS Research. The objective of Tenfold Sales is to help sales professionals in any field to dramatically improve their performance. TFS is an e-learning course that provides sales-people with the essential knowledge, skills, attitudes and insights needed to unleash their full potential as top performers in their respective fields. The practical concepts & psychological strategies presented in these lessons are based on universal principles of human accomplishment. 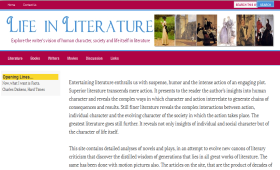 LifeinLiterature.org studies 18th century British novelist Jane Austen's work 'Pride and Prejudice', as well as other great words of literature. The story is taken as a mirror of life, and the characters and events of the story are analyzed to answers questions of human nature and life. The site contains English articles on subjects ranging from personal accomplishment, social evolution, character of life and spirituality. 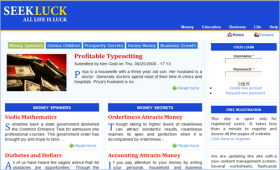 Seekluck.com is a comprehensive source of important information on income, prosperity, entrepreneurship, self-employment, career, job, educational and training opportunities available to iniduals around the world. The eBooks, articles and solutions offered in Seekluck.com have empowered many iniduals with the right knowledge and information on the path to prosperity. 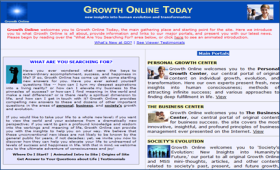 Growth Online combines years of research and experience of individuals from a number of organizations, including The Mother's Service Society (MSS); Mira International; and The International Center for Peace and Development (ICPD). The result has been a revelation of fresh, new insights into the nature of existence. Ideas like personal values, "life response", "inner-outer correspondence", the process of growth, the theory of creation, and the spiritual Reality have opened the doors to a new understanding of the nature of existence, and provided a path to our ultimate evolutionary potential.